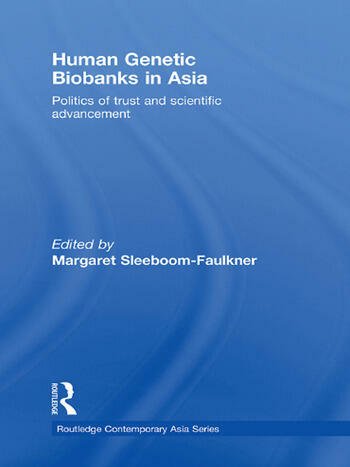 This volume investigates human genetic biobanking and its regulation in various Asian countries and areas, including Japan, Mainland China, Taiwan, Hong Kong, India and Indonesia.. It sheds light on how cultural, socio-political and economic factors influence the set-up of bioethical regulation for human genetic biobanks and how bioethical sensitivities surrounding biobanks are handled. Apart from placing discourses of trust in an international perspective, the comparative materials presented in this volume also put into perspective the concepts of genetic theft and exploitation, and genetic wealth and trust. This collection contains case studies of biobanking practices in societies with different needs and welfare levels, and provides insights into government strategies towards genetic resources by examining bioethics as practised at home. Margaret Sleeboom-Faulkner is Reader in Anthropology at the University of Sussex.